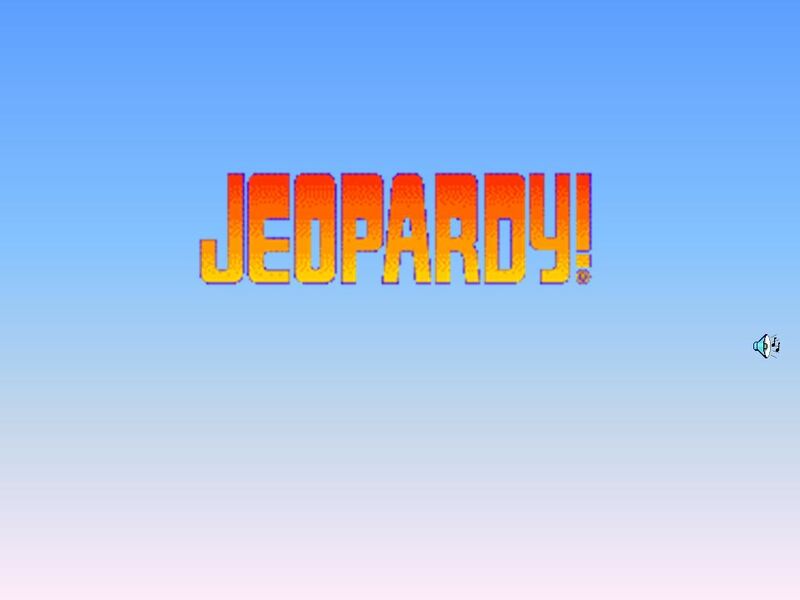 100 200 400 300 400 Geography EconomicsCivicsHistory 300 200 400 200 100 500 100. 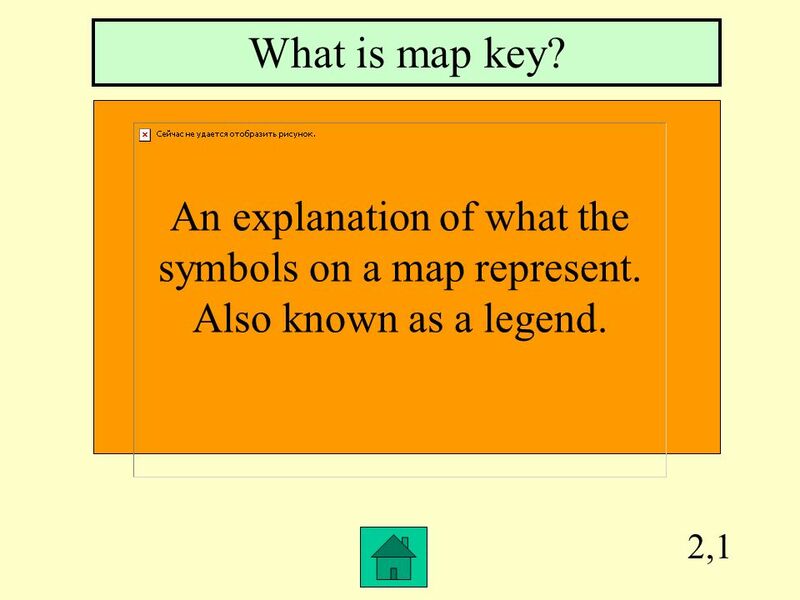 4 2,1 What is map key? An explanation of what the symbols on a map represent. Also known as a legend. 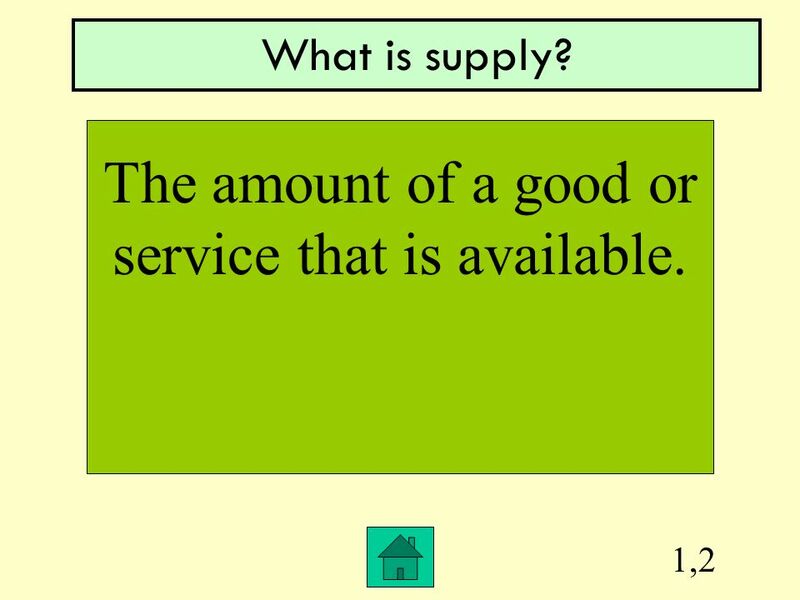 5 1,2 What is supply? The amount of a good or service that is available. 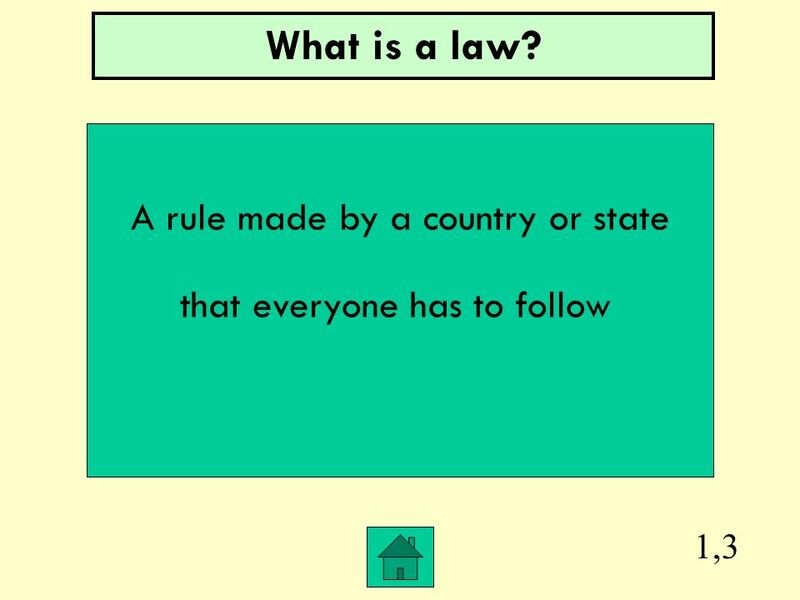 6 1,3 A rule made by a country or state that everyone has to follow What is a law? 7 1,4 What are primary sources? The original documents, photographs, or items produced by a person who participated in or observed a historical event. 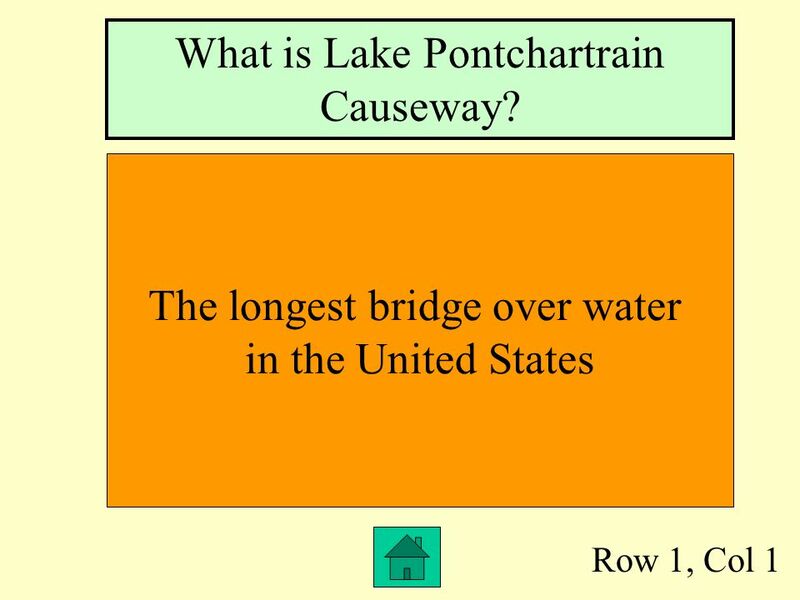 8 Row 1, Col 1 The longest bridge over water in the United States What is Lake Pontchartrain Causeway? 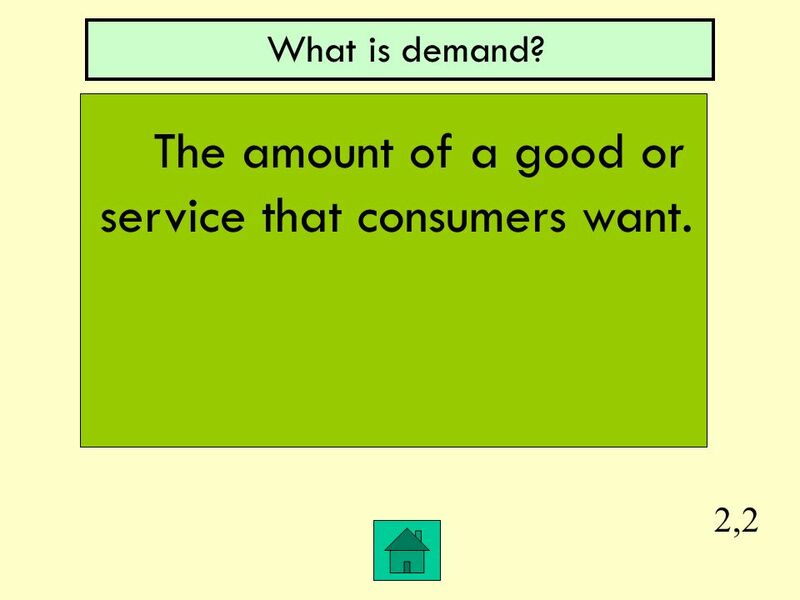 9 2,2 What is demand? The amount of a good or service that consumers want. 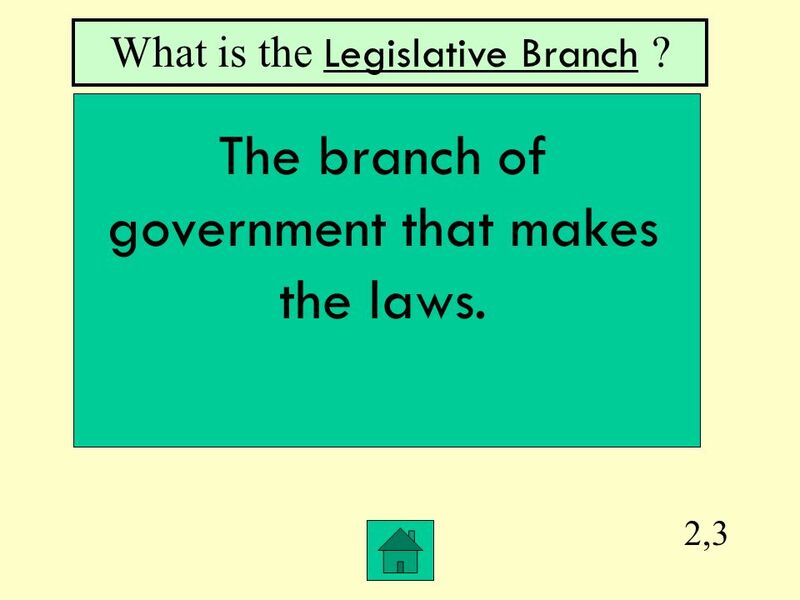 10 2,3 What is the Legislative Branch ? The branch of government that makes the laws. 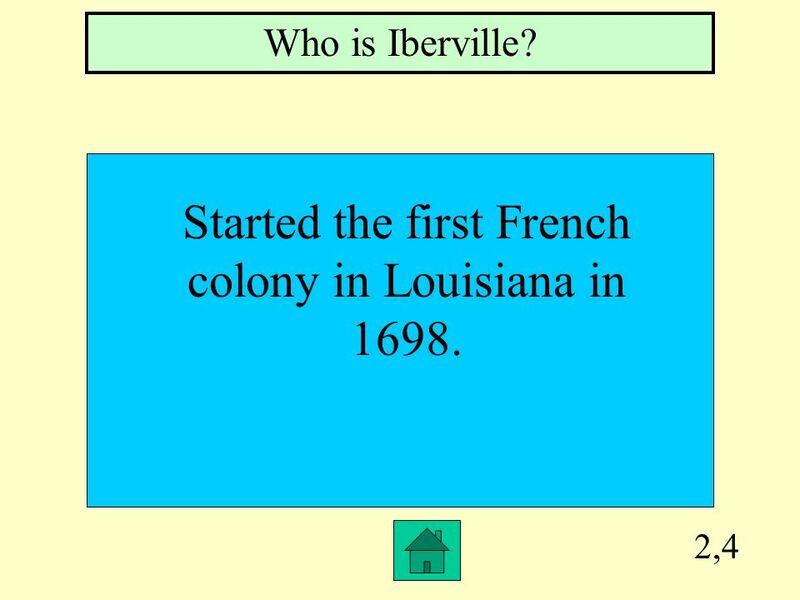 11 2,4 Who is Iberville? Started the first French colony in Louisiana in 1698. 12 3,1 The Western Coastal Plain, The Eastern Coastal Plain and The Mississippi or Alluvial Floodplain. 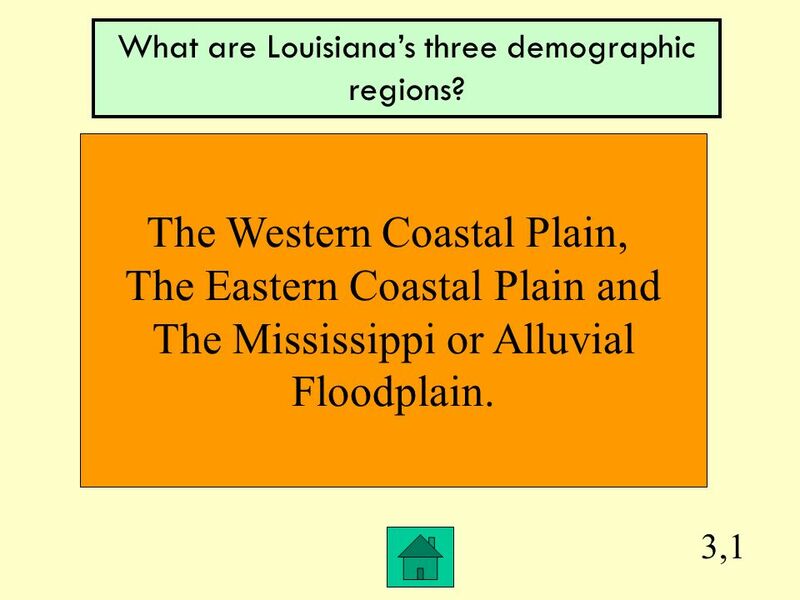 What are Louisianas three demographic regions? 13 3,2 What is Interdependence? 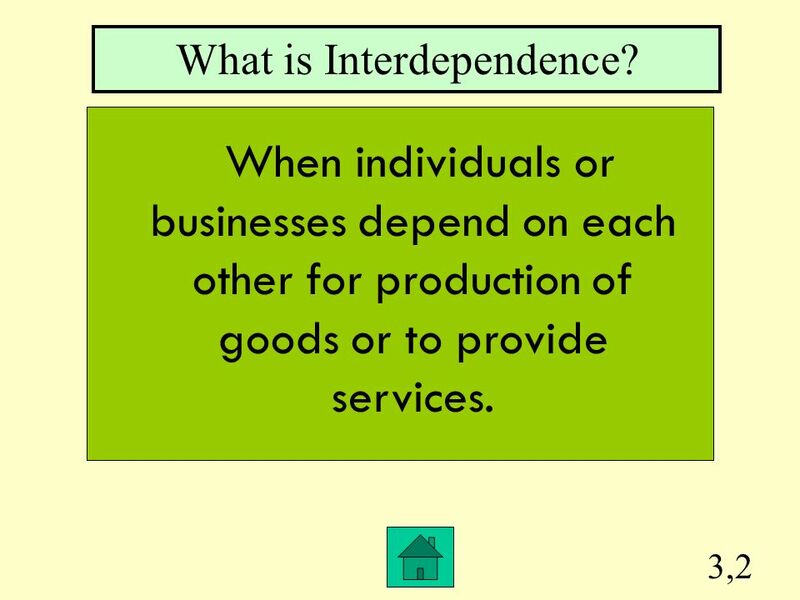 When individuals or businesses depend on each other for production of goods or to provide services. 14 3,3 What is a rule? 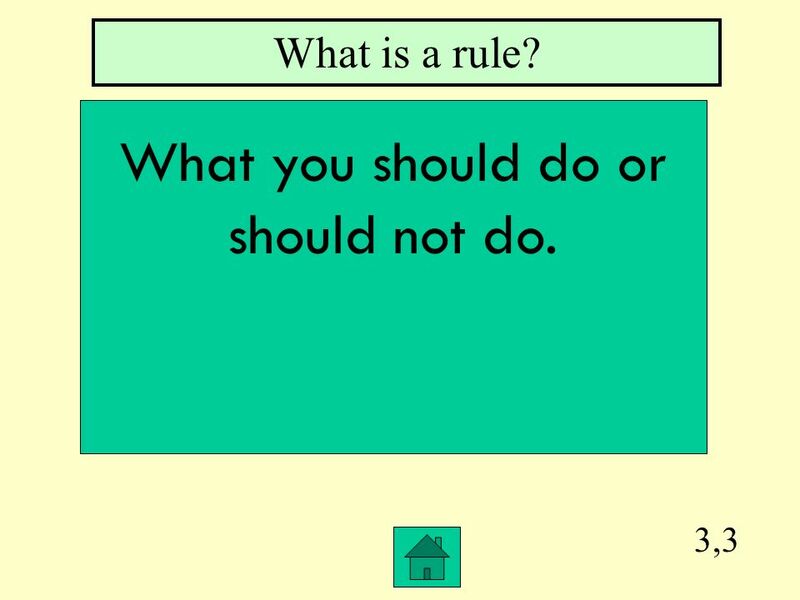 What you should do or should not do. 15 3,4 What are secondary sources? 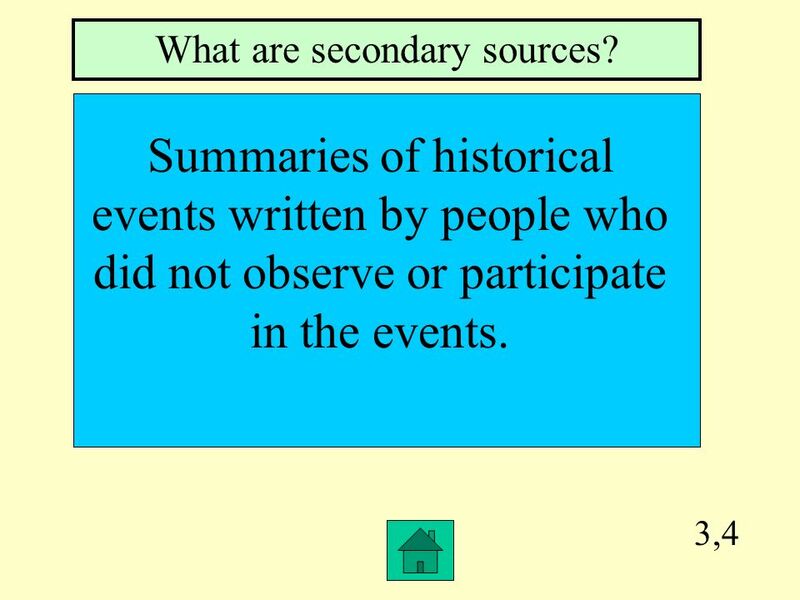 Summaries of historical events written by people who did not observe or participate in the events. 16 4,1 The largest natural lake in Louisiana. 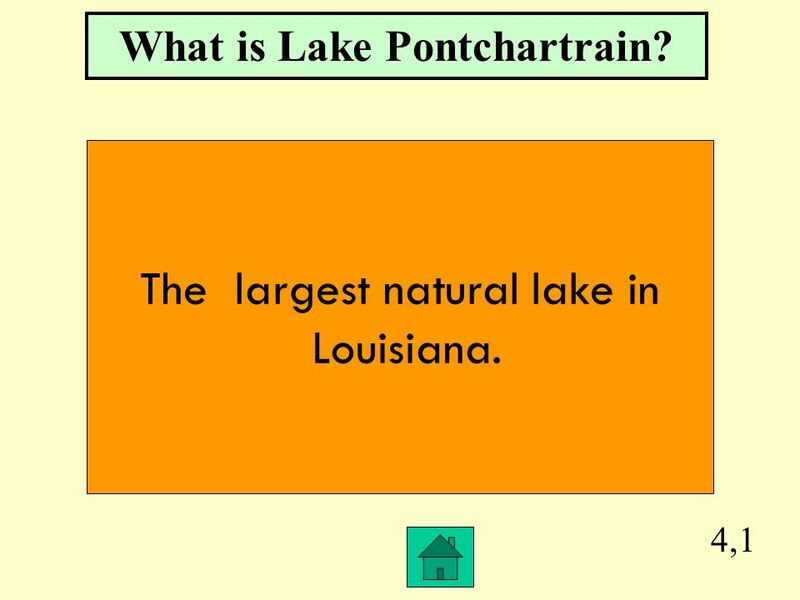 What is Lake Pontchartrain? 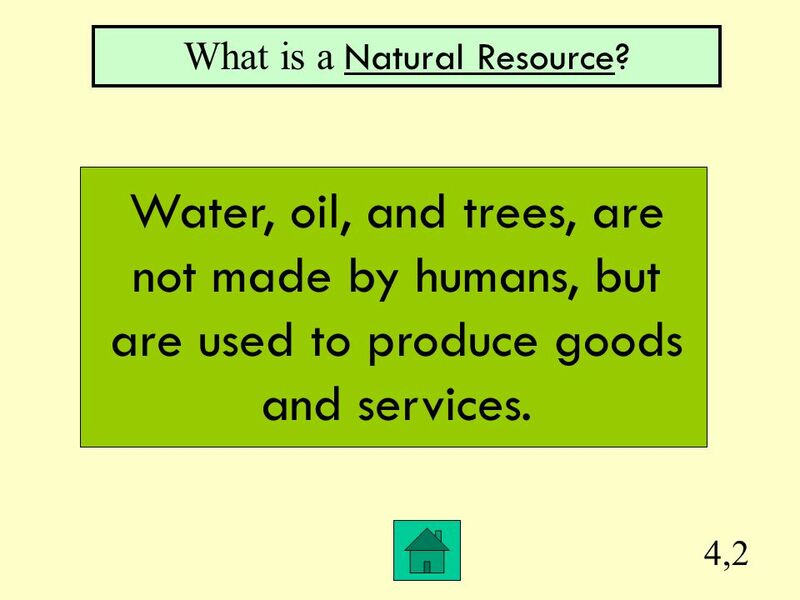 17 4,2 What is a Natural Resource? Water, oil, and trees, are not made by humans, but are used to produce goods and services. 18 4,3 What is the Secretary of State? 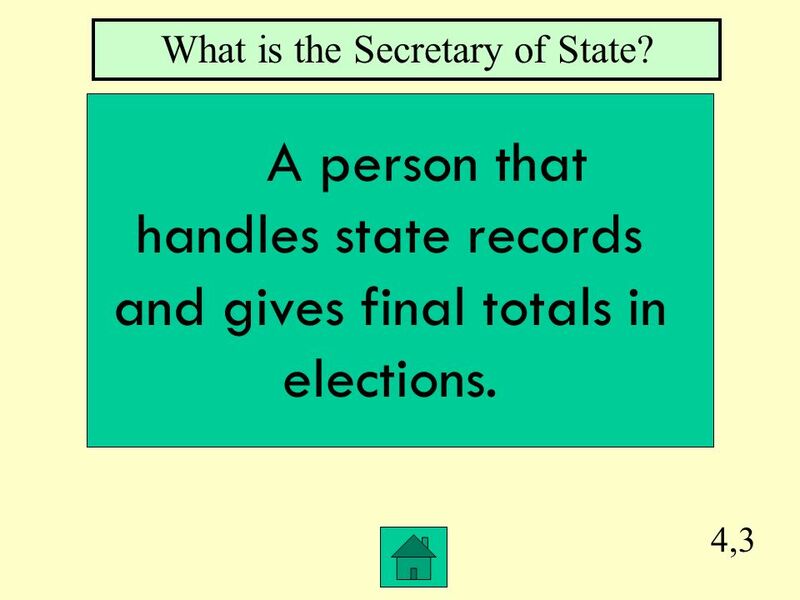 A person that handles state records and gives final totals in elections. 19 4,4 Who is Hernando de Soto ? 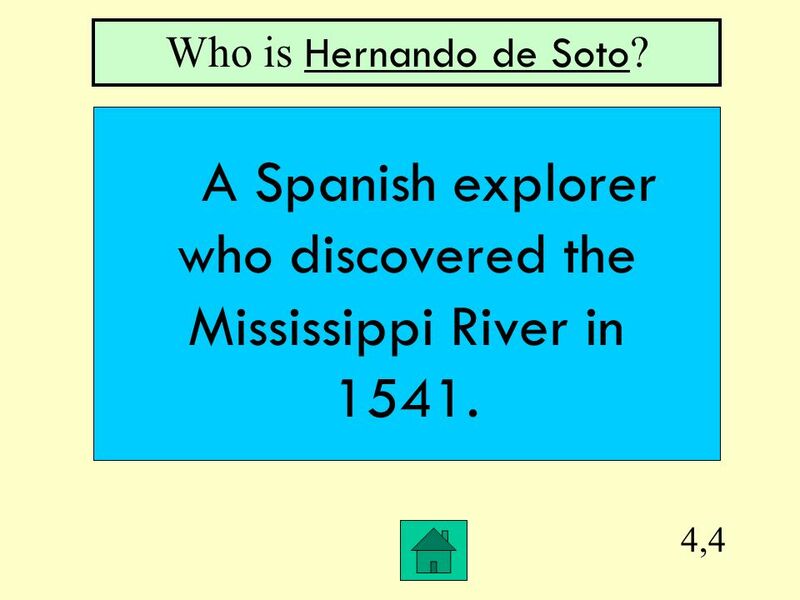 A Spanish explorer who discovered the Mississippi River in 1541. 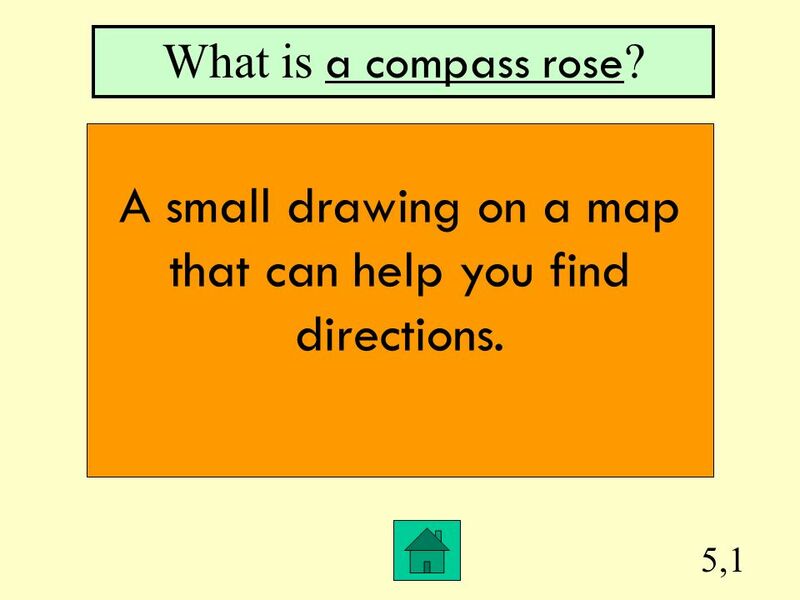 20 5,1 What is a compass rose ? A small drawing on a map that can help you find directions. 21 5,2 What are goods ? 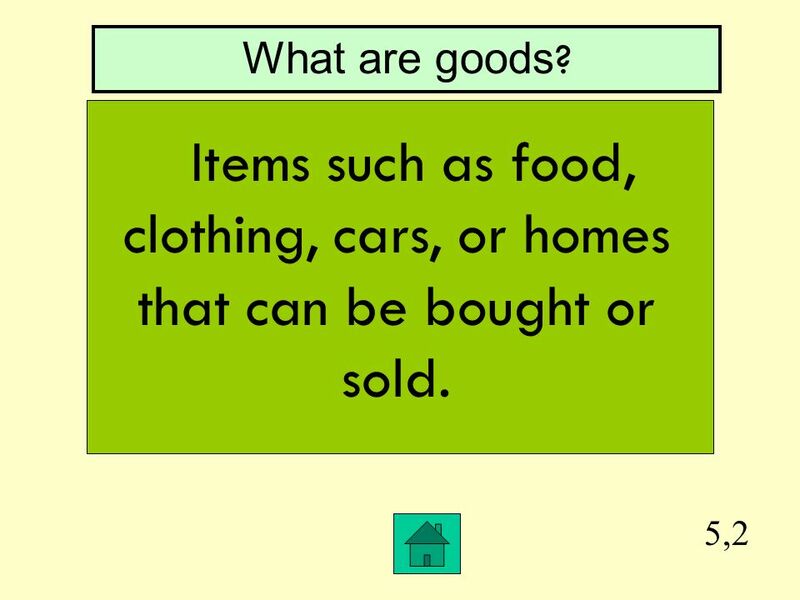 Items such as food, clothing, cars, or homes that can be bought or sold. 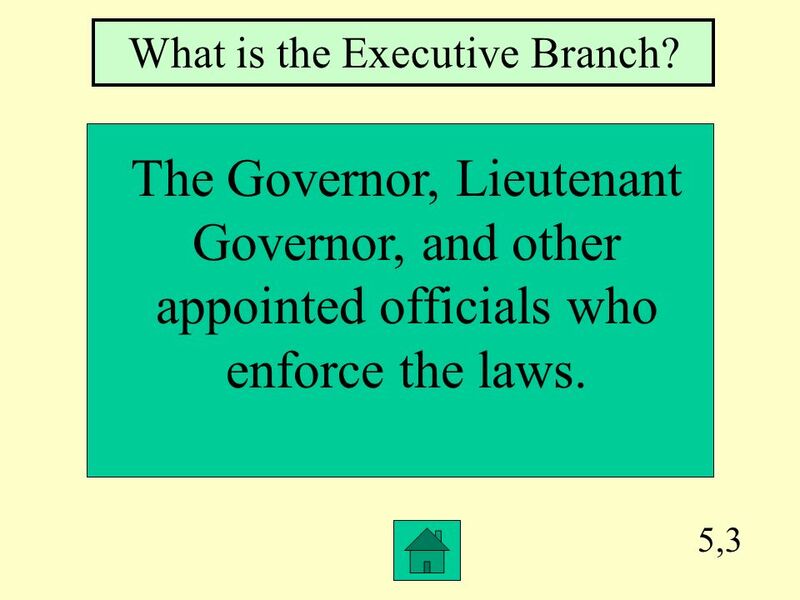 22 5,3 What is the Executive Branch? The Governor, Lieutenant Governor, and other appointed officials who enforce the laws. 23 5,4 What is Mardi Gras? 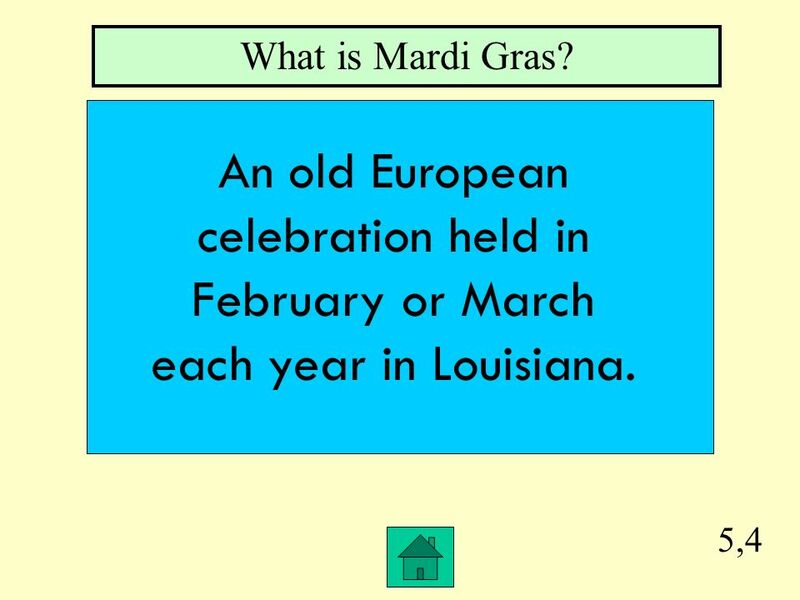 An old European celebration held in February or March each year in Louisiana. Download ppt "100 200 400 300 400 Geography EconomicsCivicsHistory 300 200 400 200 100 500 100." 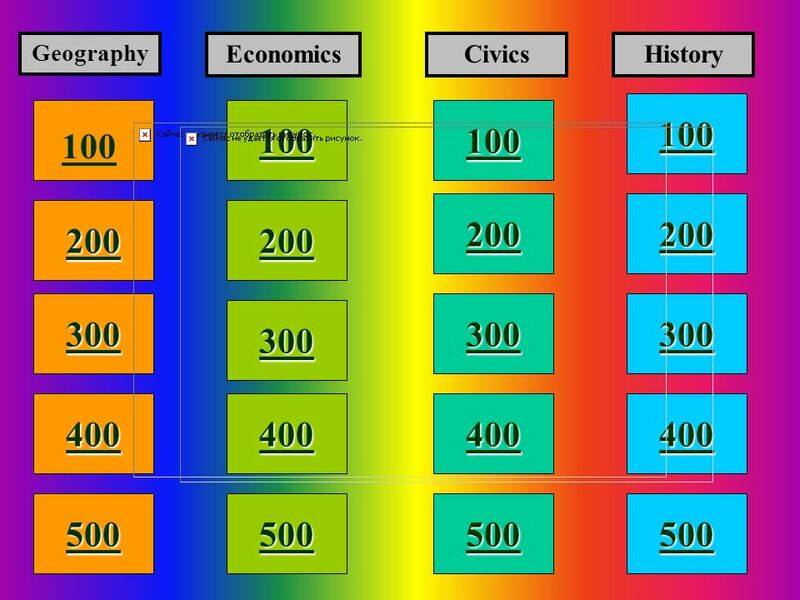 History Geography Civics Economics Miscellaneous.